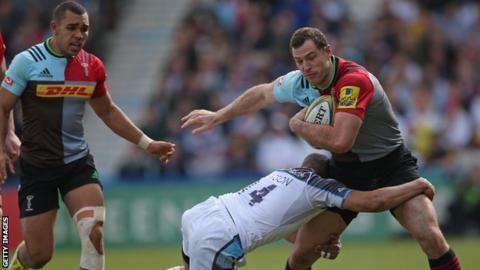 Harlequins kept their Premiership play-off hopes alive with a bonus-point victory over Newcastle Falcons, who slipped to their sixth straight defeat. Tries from Tim Visser, Jack Clifford and Joe Gray gave the home side a 21-6 half-time lead. Newcastle surged back with two Nili Latu tries and one from Marcus Watson, but Sean Robinson's sin-bin was costly. Ben Botica's kicking accuracy, Visser's second try and Marland Yarde's score finally put the home side clear. Harlequins set the pace of the game from early on but had to weather a significant Falcons comeback that saw the visitors move to within three points of their hosts with 20 minutes left. But Robinson's 66th-minute yellow card was a blow for Newcastle, and with Quins fly-half Botica unwavering off the kicking tee, tries from Visser and Yarde sealed the victory. The result means Harlequins remain in touch with the top four, just one point behind fifth-placed Northampton, who play Wasps at the Ricoh Arena on Sunday. Dean Richards' Newcastle, meanwhile, are still four points ahead of bottom side London Irish, who they host in the next round of fixtures. Harlequins: Brown; Yarde, Marchant, Roberts, Visser; Botica, Care (capt); Marler, Gray, Collier, Merrick, Horwill, Robshaw, Clifford, Easter. Replacements: Ward, Lambert, Sinckler, Twomey, Luamanu, Dickson, Hopper, Chisholm. Newcastle Falcons: Tait; Watson, Harris, Powell, Sinoti; Delany, Young; Vickers, McGuigan, Vea, Wilson, Green, Latu, Welch (capt), Hogg. Replacements: Lawson, Rogers, Hatakeyama, Robinson, Hammersley, Takulua, Willis, Agulla.